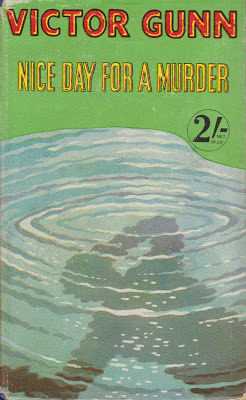 Victor Gunn, Nice Day for a Murder, 1st edition 1945. One must also mention Victor Gunn, the British crime writer. His first story was published when he was seventeen and it is suggested he wrote forty million words in his career. Nice Day for A Murder is a cliched crime story; the characters are all upper-class (Major So-and-so etc. ), the settings are Halls and Manors and all ends happily (the hero and heroine are kissing after getting engaged...). The key plot point, which is in Chapter Four and occurs when the main people are at Bassington Hall, is so stupid I nearly gave up reading the book. I persevered as overall the text had enough narrative strength (and snobbery) to make it a fun read.